Electronic Gate Shutoff – Optional extra so that gate closes when there is no power. Avoids sheep running through before machine is turned on or if power is lost. 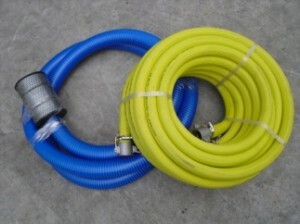 Pressure hose – (yellow) made to Electrodip’s demanding specifications. Can be cut to length depending on distance to tank. Suction hose – (blue) to join the Electrodip to your choice of pump and motors. Filters – Line, suction and pressure filters can be purchased seperately to ensure water is clean for the equipment. 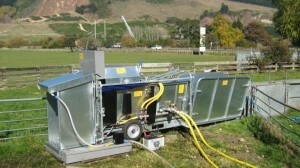 Triple Overhead Nozzles – 3 extra overhead nozzles can be added to the standard 6 for extra fleece penetration. Useful to penetrate full fleeced sheep. Side & Forward Nozzles – Side fan nozzles are used for dipping off shears. These are required for lice work off shears. Forward nozzles are designed to invade dewlap areas – recommended for scab control and dipping Merinos. Nozzles can be turned on or off as per requirements and for chemical economy. Plain Hurdles – Can be positioned at front or rear of machine to enable sheep to be drawn at an even pace, seperating them into single file. Sliding eyes allow adjustments to suit different positions and angles. V hurdles – Attaches Plain Hurdles or Prattley gates to the Electrodip. Chemi Catcher (Forward Hood) – Designed to reduce chemical drift to the atmosphere and return chemical to the reservoir if required. 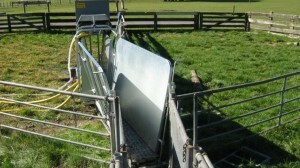 Also keeps the sheep in a straight line exiting the Electrodip to help with animal flow. Chemi Trap – with pump & cleaning ramp – Filters and returns chemical wash to the reservoir while the cleaning ramp reduces contamination for the chemi trap. Only required for environmntally sensitive areas, such as near waterways.